The Clipboard task pane in PowerPoint 2016 lets you gather up to 24 items of text or graphics from any Office program and then selectively paste them into your presentation. To summon the Clipboard task pane, click the dialog box launcher in the Home tab on the Ribbon at the bottom right of the Clipboard group. Then, the Clipboard task pane appears, as shown in the following figure. 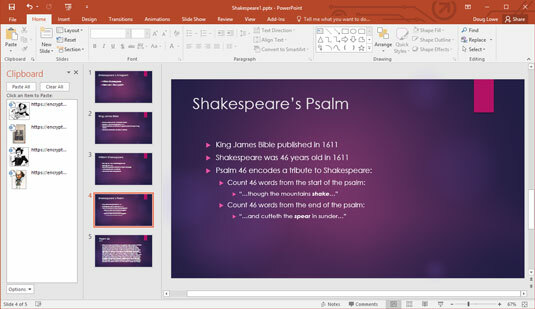 Here you can see the Clipboard task pane at the left side of the PowerPoint window, with several objects held in the Clipboard. To paste an item from the Clipboard task pane, simply click the item you want to insert.